Election Tracker LIVE: The SP-BSP alliance in Uttar Pradesh is holding its first joint campaign rally for the coming Lok Sabha elections in 25 years in Saharanpur’s Deoband. The top leaders of the parties are addressing the Deoband meeting just days before Saharanpur and seven other western UP constituencies go to the polls in the first phase of the Lok Sabha elections on April 11. ‘Unholy, Corrupt’ DMK-Congress Alliance Will End in Disaster: Rajnath Singh | Senior BJP leader and Union home minister Rajnath Singh Sunday slammed the DMK-Congress front in Tamil Nadu, saying it was not a progressive alliance, but a ‘corrupt’ and ‘unholy’ combine which would end in a ‘disaster’. The BJP’s Jammu & Kashmir unit on Sunday accused the Congress of being in habit of backing anti-Indian forces, saying its promise to amend the AFSPA in militancy-hit Kashmir will only embolden terrorists. “The Congress has always strengthened the hands of anti-Indian forces. It is shocking that the Congress has promised to revoke the AFSPA. It will only be a morale booster to terrorists and embolden them,” senior BJP leader Sham Lal Sharma told a public rally in Aknoor border belt. Take Action in Neutral, Impartial Manner: EC | The EC in a letter today to the Department of Revenue advised that all enforcement actions by the department during the elections period be conducted in a neutral, impartial and non-discriminatory manner. The EC’s letter comes after multiple raids by the IT department were conducted in the residences of Congress leaders in Bhopal. NDA Will Win More than 350 Seats: Paswan​ | Lok Janshakti Party chief and Union Minister Ram Vilas Paswan today claimed that a National Democratic Alliance (NDA) “wave” is sweeping the country and that it would win all seats in Bihar. “It is certain that Narendra Modi would become Prime Minister again as people have made their mind to support and vote the NDA to power. NDA would win all 40 Lok Sabha seats of Bihar and more than 350 across the country,” he told reporters after releasing the party’s manifesto. Vote For Congress, Vote Against Development: Yogi Adityanath | Uttar Pradesh chief minister Yogi Adityanath at a public meeting today in Peddapalli alleged that a vote given to the Congress in the Lok Sabha elections would only strengthen terrorism, Naxalism and separatist forces and obstruct development. The BJP-led government through its ‘Sabka Saath, Sabka Vikas’ principle was committed to the development of all sections of people, he said. Independence and Autonomy of Universities Will be Restored: Rahul Gandhi | Congress president Rahul Gandhi in a Facebook post today said if voted to power, his party will introduce a single-window system for education loans and bring a law that will “list the rights and duties of students”. “The Congress will restore the independence and autonomy of colleges and universities and will open new state-run varsities in backward areas of the country to ensure the expansion of education. Congress will also bring ‘Student Rights Law’ that will list the rights and duties of students,” he said. BJP Leaders are Hypocrites: Naveen Patnaik | BJD president and chief minister Naveen Patnaik at a public meeting in Rayagada, Odisha today called BJP leaders as “hypocrites”. He accused the NDA government at the Centre of neglecting Odisha. “These people (BJP leaders) have no sympathy for the poor, women and Odisha as a whole. These are all ‘Biradi Baishnab’ (hypocrites),” Patnaik said. 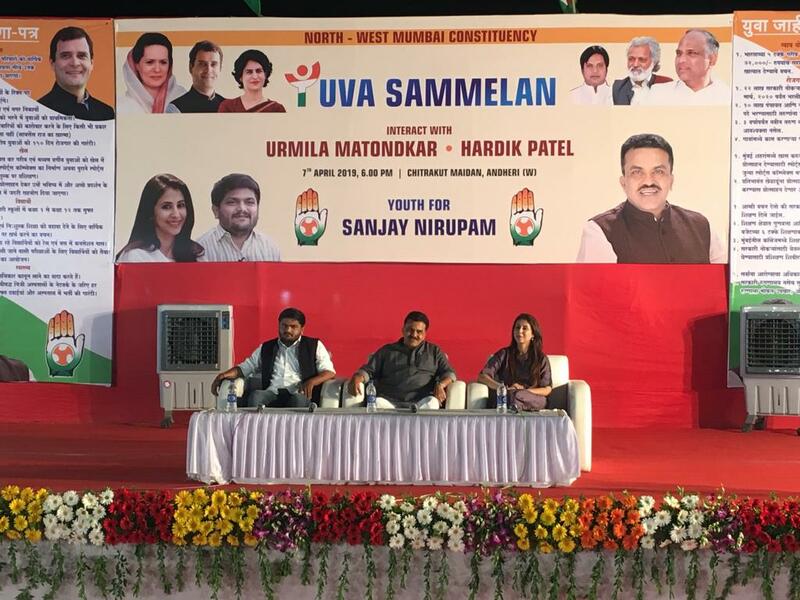 Congress’ Urmila Matondkar, Hardik Patel and Sanjay Nirupam at the party’s youth event Uva Sammelan in Mumbai. BJP Can Sense its Defeat: Kamal Nath | Madhya Pradesh chief minister Kamal Nath in a statement today has accused the BJP of using state institutions to their advantage and raiding the homes of Congress leaders. “They are doing this because they have nothing to say on the topic of development and they have nothing to show. It seems that BJP can sense its impending defeat in the Lok Sabha elections and so they are resorting to these tactics for political gains. Many states have been witness to these tactics that they have used over the last 5 years,” he said. Mayawati Under EC Scanner for Deoband Speech | The CEO has sought a report from the local administration on Mayawati’s Deoband rally speech from today where she called upon Muslims to vote for the SP-BSP alliance, and not for the Congress party. Congress’ Anand Sharma questioned the IT raids currently being conducted at the residences of Congress leaders. “Has any agency gone to the BJP to investigate how crores of money are being spent?” he asks. PM Modi Makes False Promises, Listen to His Previous Speeches: Ashok Gehlot | Rajasthan Chief Minister Ashok Gehlot today accused Prime Minister Narendra Modi of making “false promises” and claimed the Congress party would not need to campaign to win elections if people start listening to his previous speeches now, PTI reported. Addressing an election rally in Kolayat town in Bikaner district, Gehlot said people had high expectations from the prime minister but an environment of “fear, violence and hatred” was created in five years. Wayanad is a Wrong Decision for Rahul Gandhi: CPI | The CPI today said Congress president Rahul Gandhi’s contest in Wayanad Lok Sabha seat in Kerala against the party candidate was a “wrong decision”. “It is a wrong decision by Gandhi. It has sent a wrong signal among the people about the intention when both the Left parties and Congress were fighting against the BJP,” CPI General secretary S Sudhakar Reddy told the media. Don’t Commit the Same Mistake: Amit Shah | “If the Modi government sent money for the development of the State and that did not reach the people here, then BJD government needs to be thrown out. If you commit the mistake this time again, you will continue to have chit fund scams and your mines will be sold to industrialists,” Amit Shah says. 0% Loans to Farmers If Elected: Amit Shah | BJP president Amit Shah at a public meeting in Odisha says if the BJP is voted to power, then the government will immediately implement the super-welfare Ayushman Bharat for the poor, as well as to provide loans at 0% interest to farmers and labourers. RJD leader Tejashvi Yadav was not allowed to meet his father and party chief Lalu Prasad Yadav in jail. NCP leader Ajit Pawar campaigns at Chinchwad for his son Parth Pawar. Modi Govt Destroyed Institutions: Kumaraswamy | Taking a swipe at the BJP, Karnataka chief minister HD Kumaraswamy today said the only ‘contribution’ of the Narendra Modi-led NDA government at the Centre is that it had “decimated” the constitutional institutions in the country during the last five years, PTI reported.